CLIPSO® creates custom ceiling coverings that can be transformed into a diverse range of sophisticated shapes to perfectly fit any construction or renovation project. 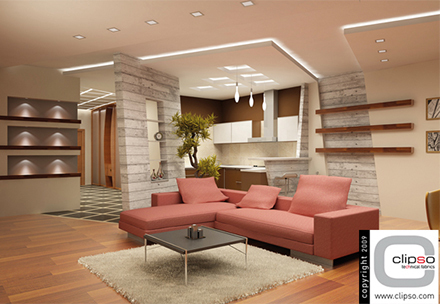 The coverings make customizing any room in your home both convenient and simple. Since no heat or water is used in the application, our cold stretch ceiling coverings generate very little waste. Installation is fast and easy. Any ceiling can be customized with a print using CLIPSO’s large design gallery. 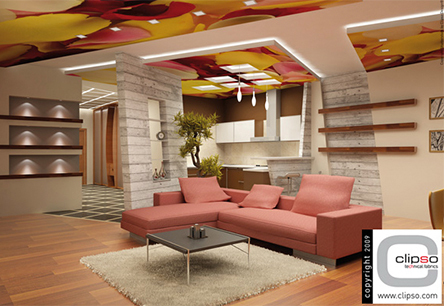 Personal photographs, artwork or designs can also be used to customize your ceilings. For more visual examples of our custom home ceiling coverings, take a look at the before and after photos from past home renovations as well as our extensive gallery of photos.